SAN DIEGO — Anyone who has taken piano lessons for any length of time has put his hands to Scott Joplin’s “The Entertainer”. It takes hours of dedicated practice to master. But once you get the feel of it, it’s a lot of fun to play. These intoxicating syncopated rhythms chose Robert Barry Fleming to give them a new life, which he does through Mo’olelo Performing Arts Company, under the direction of George Ye, at the 10th Ave. Center for the Arts through Oct. 12. More than a biography play, Scott Joplin’s New Rag is “a contemporary meditation on Joplin’s historical legacy. … Spoken word, hip hop and live ragtime music propel this theatrical exploration into the mind and music of this genius who lived during a Gilded Age which only glittered for some.” (Press Release) A gifted and animated storyteller, Fleming embodies Joplin and other characters that come in and out of his life. Classically trained, Fleming speaks with beautiful clarity, adding his own poetry slam style rhyming couplets and rave dance moves. The effect of going back and forth between two centuries was a bit jarring, yet adds an electricity that crackles. When President Theodore Roosevelt invited the acclaimed Booker T. Washington to dine at the White House, it caused quite a stir. Racist “dixiecrats” were aghast that a common n***r would be given such an honor. Joplin wrote his first rag time opera, “A Guest of Honor” to commemorate the event. …But copies were confiscated to pay his debts and then “lost”. Like the music, David Weiner’s set is playful and simplistic. 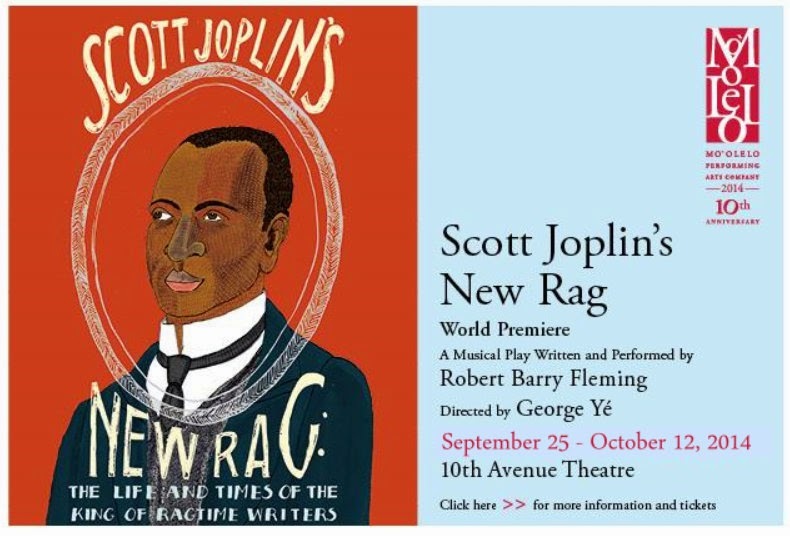 If you would like to set your toes tapping and let your soul be touched by a true American tragedy, come see Robert Barry Fleming in Scott Joplin’s New Rag at the 10th Ave Center for the Arts.